The coffee is being grown inside Indonesia’s Bukit Barisan Selatan National Park, which has over 300 bird species and is one of the few places where the endangered Sumatran subspecies of tigers, elephants, and rhinos coexist. This park has already lost 30% of its land to illegal agriculture, mainly coffee. WWF found 173 square miles being used for illegal coffee growing, with a yield of nearly 20,000 tons of coffee annually. Wildlife has abandoned these cultivated areas. WWF tracked the illegal coffee from the park through export routes to multinational coffee companies using satellite imaging, interviews with coffee farmers and traders, and trade route monitoring. The U.S. received 17% of the coffee tainted with illegally grown beans. Illegal beans are sold to local traders, who mix them with legally grown beans which then make their way to exporters. Major international companies purchase beans from exporters, and if they are not conscientious about their supply chain, they may not know they are buying illegal beans. The main buyers are shown in this graph from the report (click to enlarge), with Kraft being the number one buyer. Exports of robusta beans from Lampung province, where most the park lies, have been steadily increasing, and the top six companies on the graph buy 55% of all Lampung beans. The profits spurring the encroachment into the park are financed by the purchases of these global roasters, and all Lampung beans have a very high probability of being contaminated with illegally grown beans, according to WWF. 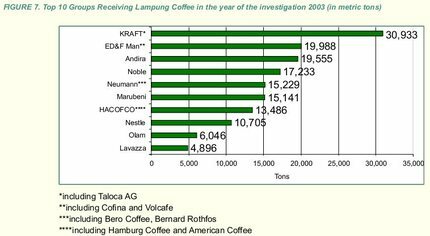 Talcoa (part of Kraft Foods), Kraft, and Nestlé were the top recipients in 2003-2005; Folgers (Procter & Gamble) and Starbucks received smaller amounts in 2004. After being contacted by WWF, Kraft and Nestle were among five companies in the early stages of “engaging with WWF” on the problem. Four companies, including ED&F Man, parent company of VOLCAFE (which supplies beans to Nestlé and Maxwell House), denied involvement. Eight other companies did not reply (full list in report). Remember this is robusta coffee, so you don’t have to worry about the Sumatran arabica beans from your favorite specialty roaster. The illegal beans are those used in most supermarket blends. Another reason to not buy these coffees! See update #1 here and a late 2007 update here. Hat tip to Ned Potter’s ABC News Science and Technology blog. Map adapted from GoVacation Indonesia.